...... as set Video Bitrate, trim video, crop video, make watermark and take snapshot. 4Easysoft WMV Converter allows you to set the video Brightness, Contrast, Saturation. Checking Deinterlacing helps you to convert interlaced video to the progressive video, this function can optimize the video effect. Trim any segment of your video by setting the start time and end time or dragging the slider bar. 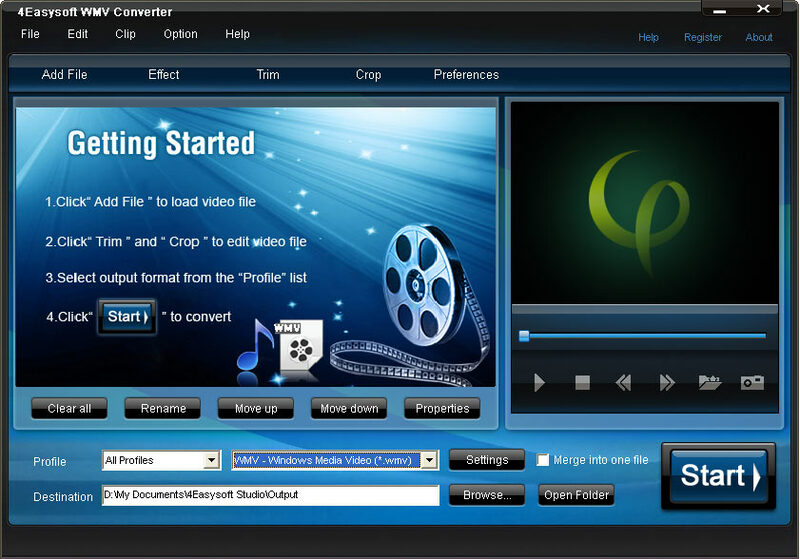 This WMV Converter doubles your enjoyment with joining several interesting clips into one. Crop off the black edges of video, set the screen aspect ratio by keeping original/ full screen/16:9/4:3. Qweas is providing links to 4Easysoft WMV Converter 4.0.10 as a courtesy, and makes no representations regarding 4Easysoft WMV Converter or any other applications or any information related thereto. Any questions, complaints or claims regarding this application 4Easysoft WMV Converter 4.0.10 must be directed to the appropriate software vendor. You may click the publisher link of 4Easysoft WMV Converter on the top of this page to get more details about the vendor.